It isn’t Fabry I’m interested in on this occasion, however, but his wife Marie Collinet. It’s easy to assume that medicine was an exclusively male profession until women were finally admitted to the professional bodies in the nineteenth century, but that really isn’t the case. Although physicians and surgeons in the early modern period were usually men, entire areas of medicine (notably midwifery) were dominated by women. Marie Collinet was indeed an expert in childbirth, but her interests went very much deeper than that. She set out by assisting her husband in treating wounds, but became so adept at surgery that she was asked to stand in for Fabry when he was away. She is remembered today for her innovations in treating bone fractures, and for obstetric techniques (notably the use of a blunt hook for dilating a narrow cervix) which were used for many years afterwards. 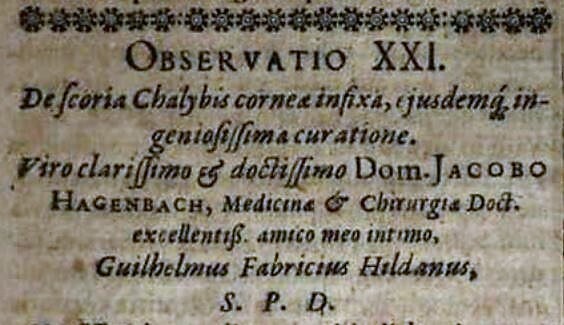 Another of her triumphs was documented by her husband in a letter he wrote on April 25 1624 to a close friend and colleague in Basel, Jacob Hagenbach. Benedictus Barquin, a farmer from the valley of St Mie (as they call it) near Lake Biel, was buying some iron from a merchant and wanted to select the best; so he struck one piece against another, as people often do. A spark flew into the part of the eye which contains the iris and stuck firmly to the cornea, causing him great pain. Iron filings in the eye are still a common occupational injury today, although the routine use of safety goggles has reduced its incidence considerably since the mid-20th century. His family tried to help him for several days, but without success; indeed, the pain and inflammation increased significantly. On March 5th he came to see me at Bern, and was first put on a judicious diet, then purged, first by drugs and then through bloodletting (for he was of plethoric constitution). ‘Plethoric’ refers to a superabundance of blood. Under the ancient humoral system of medicine, such an imbalance of the bodily fluids could and should be relieved by bleeding. Lack of moderation in diet, drink and lifestyle was widely believed to cause a plethoric state. For several days I tried to extract the splinter, first with instruments and then by several other means, but it was so tiny that it proved impossible to remove it using these implements. So I decided to explore another possibility, and attempted to extract it with the help of a little bag which I mentioned in an earlier article, but again my time and effort were wasted. And lo and behold, my wife then devised by far the most suitable remedy. Historians of medicine have tended to give Fabry credit for this ‘most suitable remedy’. It should be emphasised that this reflects their sexism, not that of the surgeon, who is at pains to give his wife all due acknowledgment. In the original Latin he precedes the words uxor mea (‘my wife’) with the interjection en (‘lo!’ or ‘look here!’) – a tiny word usually omitted by translators but used to draw attention to something important or remarkable. To underline his admiration, Fabry says that she did not merely come up with a ‘suitable remedy’ but ‘by far the most suitable remedy’. While I held open the patient’s eyelids with both hands, she brought a magnet as close to his eye as he could bear. After we had done this repeatedly (the patient could not stand the light, which was so much needed for this procedure, for long), we finally saw the piece of iron jump out of the eye on to the magnet. What a satisfying moment that must have been! He made a speedy recovery with the help of a soothing eye salve. A perfect result. This was the first recorded instance of a magnet being used to extract a metallic foreign body from the eye. Almost four hundred years later, ophthalmologists are still using an almost identical technique. 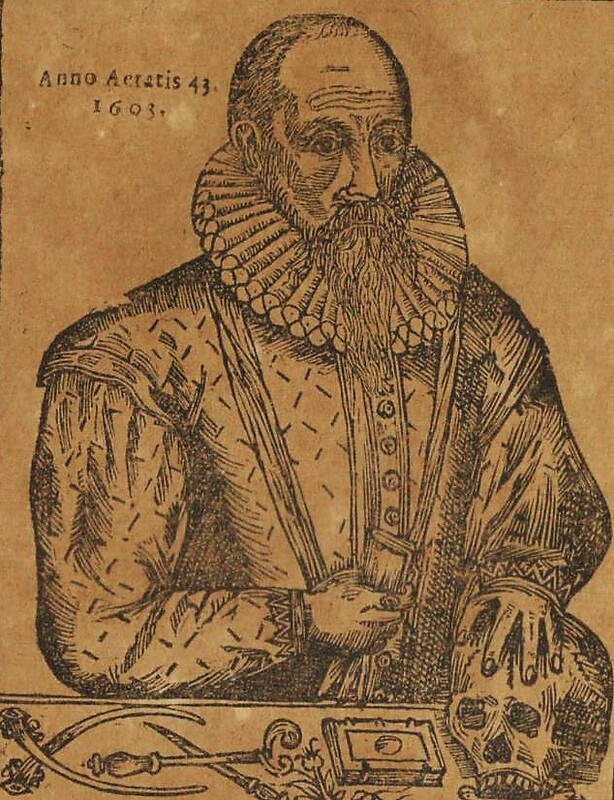 Wilhelm Fabry, aka Fabricius Hildanus. Sadly there seem to be no surviving pictures of Marie Colinet.